Richard Jackson, Pump Pee Doo. Fiberglass, pumps, buckets, acrylic paint, MDO, 132 x 240 x 240 in. Courtesy Rennie Collection, Vancouver. Photo: Site Photography © Richard Jackson. 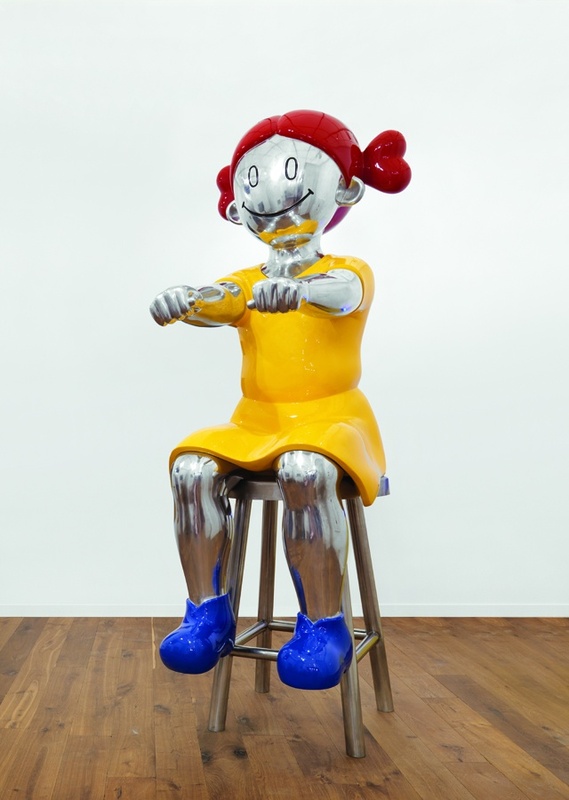 Richard Jackson, Big Girl (Yellow). 2008. Aluminum, color, 135 7/8 x 47 1/4 x 53 1/8 in. Courtesy the artist and Hauser & Wirth © Richard Jackson. Richard Jackson, Beer Bear. 2010. 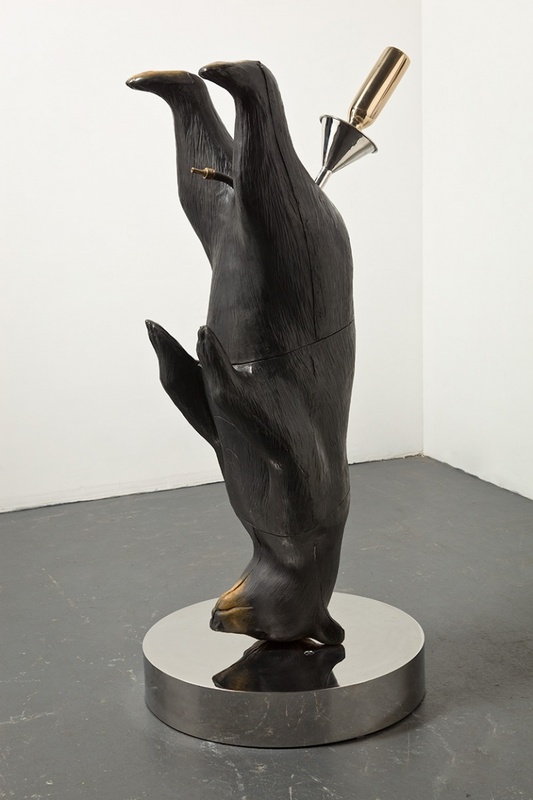 Bronze, stainless steel, 66 7/8 x 39 3/8 x 26 3/8 in. Courtesy the artist and Hauser & Wirth. Photo: Fredrik Nilsen © Richard Jackson. Richard Jackson (born 1939) is well known for combining a playful sense of humor and sharp wit with an unconventional approach to painting. Influenced by Abstract Expressionism and action painting, he meticulously engineers sculptural machines that he activates, causing violent eruptions or seeping trickles of paint. 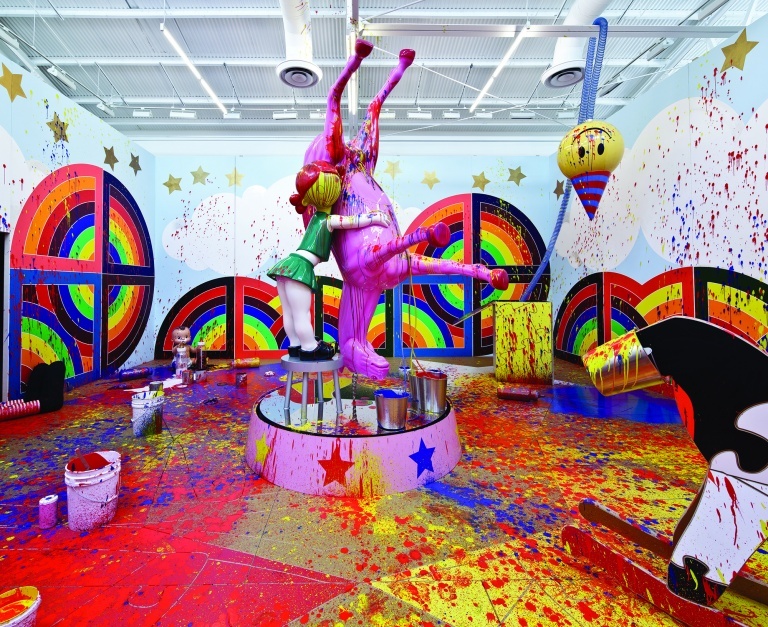 The liquid pigments — often comically meant to suggest bodily fluids — are spurted, splattered, and sprayed on gallery walls, pedestals, and floors. Jackson also works in neon, paper, and canvas. He draws from a broad visual lexicon, which includes domestic environments, universal human functions and activities, and what he sees as hallmarks of American life, such as hunting and sports as well as consumerism and addiction to oil. Through what he describes as his alleged paintings, Jackson questions traditions in the contemporary art world. Born and raised in Sacramento, Jackson studied art and engineering at Sacramento State from 1959–1961 and held his first solo exhibition at the Crocker Art Museum in 1961. He has lived in the Los Angeles area since 1968 but frequents the Sacramento region, where he maintains his family’s ranch. His work has since been shown at museums and important venues around the world.